Ramallah, 23 July 2012 – Following a visit today by Addameer lawyer Mona Nadaf, Addameer can confirm that Palestinian hunger striker Akram Rikhawi has ended his hunger strike after reaching an agreement with the Israeli Prison Service. Akram ended his hunger strike yesterday evening after 102 days. As part of the agreement Akram will be released on 25th January 2013, which is six months prior to his original release date. Addameer’s lawyer visited Akram in Ramleh prison, where he remains in critical condition. It was agreed that upon his release he will return to his home in the Gaza Strip. weak and is currently taking only water and vitamins. Tags: Hunger, hunger striker, Rikhawi. Filed under Israel and Palestine, israel and palestine articles, israel and palestine conflict by Father Dave on Jul 24th, 2012. Comment. Act Now to Save Akram al-Rikhawi’s life! 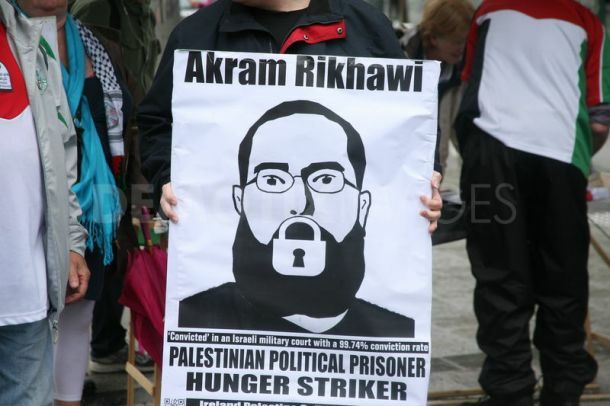 Akram al-Rikhawi has now been on hunger strike for 95 days. He is the longest serving hunger striker anywhere in the world. He is suffering from numerous medical conditions, including diabetes, asthma, high cholesterol, osteoporosis, glaucoma, kidney problems and immune deficiency. Addameer reports that “Prior to his arrest, Akram received injections of Kenacort to treat his asthma, but following his arrest, the Israeli Prison Service (IPS) did not allow Akram to take this injection. Instead, it was replaced with injections of cortisone, which is most likely the cause of severe complications, resulting in additional chronic illnesses such as diabetes and osteoporosis, from which Akram now suffers.” Take action today to call for the immediate release of Akram al-Rikhawi! Akram began his hunger strike on April 12 of this year to demand his early release due to his heath circumstances. He also has eight children, and he and his wife are also responsible for the care of the five children of his late brother. Despite his severe health circumstances and his difficult family and economic straits and responsibility for 13 children, his appeals for early release in 2012 and on June 5, 2012 were both rejected. He did not stop his hunger strike on May 14 at the time of the agreement between prisoners and the Israel Prison Services because his unique circumstances were not addressed – namely, early release on medical grounds. Physicians for Human Rights were denied access to Akram for nearly two months, until June 6. He has lost 26.5% of his body weight – and was already very unhealthy. Akram has been refusing medical examinations since mid-May – and in response, the cortisone injections have only increased. PHR has stated that he must be transferred immediately to a civilian hospital in order to receive proper medical care, and filed suit to demand he be transferred – which was denied by an Israeli District Court on June 14. Since June 16, he has been refusing supplements and other forms of artificial nourishment that the Israeli prison hospital has attempted to impose on him. He has now been on hunger strike for 95 days. He is in severe danger. International action is urgently needed to save his life! It is urgent that we act now to free Akram Rikhawi and secure his much-needed medical care. Samer al-Barq has now been on hunger strike since May 22, for 55 days, protesting Israeli violations of the agreement with the prisoners – after his own administrative detention, rather than expiring as agreed by the Israelis at the end of the strike, was renewed for an additional three months. Samer al-Barq is now on hunger strike until his release is secured. Hassan Safadi, a long-term hunger striker who had been striking for 71 days at the time the May 14 agreement was concluded, had his administrative detention order renewed by the Israelis on June 21, despite the explicit agreement that the long-term hunger strikers such as Safadi serving in administrative detention without charge or trial would not have those orders renewed. Safadi is now on his 25th day of hunger strike and plans to continue until he is released. The Israeli Prison Services have continued to violate the May 14 agreement in numerous ways – Dirar Abu Sisi remains in solitary confinement and another prisoner was recently moved to isolation. Although family visits to Gaza prisoners have now been announced, they will be “experimental,” apply only to 25 of the 479 prisoners and will exclude prisoners’ children from visits. After his 96-day hunger strike, Palestinian soccer star Mahmoud Sarsak returned on July 10 to his home in Gaza to a hero’s welcome. It is urgent that we act now for all Palestinian prisoners to return to their families and homes like Sarsak. Administrative detention, mass roundups, and military trials are continuing in Palestine. International solidarity and action is needed to hold the occupation accountable for its ongoing imprisonment and abuse of the people of Palestine! 1. Sign a letter demanding the Israeli state transfer Akram Rikhawi, Samer al-Barq and Hassan Safadi immediately to hospitals and release them. Tell the Israeli Prison Services that the world is watching! Click here to sign. 2. Sign this letter, circulated by UFREE, to members of the European Parliament and demand action to save the life of Akram Rikhawi. 4. Contact your government officials and demand an end to international silence and complicity with the repression of Palestinian political prisoners. In Canada, Call the office of John Baird, Foreign Minister, and demand an end to Canadian support for Israel and justice for Palestinian prisoners, at : 613-990-7720; Email: bairdj@parl.gc.ca…. In the US, call the office of Elizabeth Jones, Acting Assistant Secretary of State for Near East Affairs (1.202.647.7209). Demand that Elizabeth Jones bring this issue urgently to his counterparts in Israel. Tags: Hunger, hunger striker, hunger strikers, Rikhawi. Filed under israel and palestine articles by Father Dave on Jul 18th, 2012. Comment. fact that nearly 2,000 Palestinian inmates had called off their own 28-day hunger strike weeks ago. Although the story of Palestinian prisoners in Israel speaks to a common reality of unlawful detentions and widespread mistreatment, Sarsak’s fate can also be viewed within its own unique context. The soccer player, who once sought to take the name and flag of his nation to international arenas, was arrested by Israeli soldiers in July 2009 while en route to join the national team in the West Bank. Sarsak was branded an “illegal combatant” by Israel’s military judicial system, and has since been imprisoned without any charges or trial. Sarsak is not alone in the continued hunger strike. Akram al-Rekhawi, a diabetic prisoner demanding proper medical care, has refused food for over 50 days. At the time of writing of this article, both men were reportedly in dire medical condition. Sarsak, once of unmatched athletic build, is now gaunt beyond recognition. The already ill al-Rekhawi is dying. According to rights groups, an Israeli court on May 30 granted prison doctors 12 more days before allowing independent doctors to visit the prisoners, further prolonging their suffering and isolation. Physicians for Human Rights – Israel (PHRI), which has done a remarkable job battling the draconian rules of Israeli military courts, continues to petition the court to meet with both Sarsak and al-Rekhawi, according to Ma’an news agency. Sadly, the story here becomes typical. PHRI, along with other prisoners’ rights groups, are doing all that civil society organizations can do within such an oppressive legal and political situation. Families are praying. Social media activists are sending constant updates and declaring solidarity. Meanwhile, the rest of the world is merely looking on – not due to any lack of concern for human rights, but due to the selective sympathy of Western governments and media. Think of the uproar made by US media over the fate of blind Chinese political activist Chen Guangcheng. When he took shelter in the US embassy in Beijing, a near-diplomatic crisis ensued. Guangcheng was finally flown to the US on May 19, and he recently delivered a talk in New York before an astounded audience. “The 40-year-old, blind activist said that his lengthy detention [of seven years] demonstrates that lawlessness is still the norm in China,” reported the New York Post on May 31. “Is there any justice? Is there any rationale in any of this?” Chen asked. Few in the US media would contend with the statement. But somehow the logic becomes entirely irrelevant when the perpetrator of injustice is Israel, and the victim is a Palestinian. Al-Rekhawi is not blind, but he has many medical ailments. He has been in Ramle prison clinic since his detention in 2004, receiving severely inadequate medical care. Sarsak, who has been a witness to many tragedies, is now becoming one. The 25-year old had once hoped to push the ranking of his national team back to a reasonable standing. If Palestinians ever deserve to be called “fanatics”, it would be in reference to soccer. As a child growing up in Gaza, I remember playing soccer in increments of a few minutes, braving Israeli military curfews, risking arrest, injury and even death. Somehow, in a very crowded refugee camp, soccer becomes tantamount to freedom. Palestine’s ranking at 164th in the world is testament not to any lack of passion for the game, but to the constant Israeli attempts at destroying even that national aspiration. The examples of Israeli war on Palestinian soccer are too many to count, although most of them receive little or no media coverage whatsoever. In 2004, Israel blocked several essential players from accompanying the national team out of Gaza for a second match against Chinese Taipei. (Palestine had won the first match 8-0.) The obstacles culminated in the March 2006 bombing of the Palestinian Football Stadium in Gaza, which reduced the grass field to a massive crater. Then, in the war on Gaza (Operation Cast Lead 2008-09), things turned bloody as Israel killed three national soccer players: Ayman Alkurd, Shadi Sbakhe and Wajeh Moshtahe. It also bombed their stadium again. Sarsak was a promising new face of Palestinian soccer. In times of Palestinian disunity and factionalism, it was the national team that kept a symbolic unity between Gaza and the West Bank – and indeed Palestinians everywhere. These young men exemplify hope that better times are ahead. But Sarsak’s star is now fading, as is his life. His mother, who hasn’t seen him since his arrests, told Ma’an that she thinks of him every minute of each day. “Why is there no one moving to save his life?” she asked. Sarsak is the Bryant of his people. But ask any political commentator and he will tell you why Mohmoud Sarsak is not Kobe Bryant, and why al-Rekhawi is not Chen. It is the same prevalent logic of a powerful Washington-based pro-Israel lobby and all the rest. Even if the logic was founded, why are international sports institutions not standing in complete solidarity with the dying Sarsak? Why don’t soccer matches include a moment of solidarity with killed Palestinian players, and the dying young man aching to join his teammates on the field once more? Why is Israel not fully and comprehensively boycotted by every international sports organization? “As long as Sarsak remains indefinitely detained and as long as Israel targets sport and athletes as legitimate targets of war, they have no business being rewarded by FIFA or the UEFA, let alone even being a part of the community of international sports,” wrote Zirin (the second being the European footballing organization). That would be a belated step, but an unequivocally urgent one, for Palestinian sportsmen are literally dying. Ramzy Baroud is an internationally syndicated columnist and the editor of PalestineChronicle.com…. His latest book is My Father Was a Freedom Fighter: Gaza’s Untold Story. Tags: Hunger, national soccer team. Filed under Israel and Palestine, israel and palestine articles, israel and palestine conflict by Father Dave on Jun 7th, 2012. Comment. Thank you, Father Jim, for letting us know about the Palestinian Mother’s Day march. 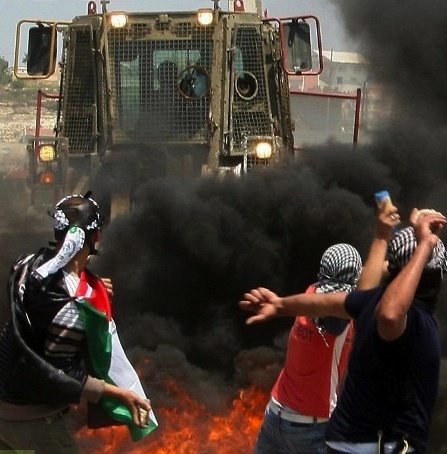 It seems that when Palestinians protest the Occupation with violence they are condemned. When they protest peacefully, they are ignored! Marchers moved through the streets of Hebron, Kafr Qaddoum, Nablus, Nabi Saleh, Ni’lin, Ramallah, al-Walaja and outside of Ofer prison. The picture here was taken in Hebron. Why did the 2012 Methodists only hit .500? The Methodist Board of Pensions and their allies roamed about the floor of the conference spreading the lie that divestment from these companies would threaten Africa University’s funding. Those prefabrications were aimed at Central Conferences (overseas) delegates, who are very protective of their continent’s Methodist University. One “party” involved is the IDF, shown in action at the pictures above and below. In this picture, smoke makes it difficult to determine if the IDF vehicle is a Caterpillar product. Perhaps not, since it is smaller than the Caterpillar tractors that built the Wall, and continues to demolish Palestinian homes. Prinz and Stone may think they are channeling Reinhold Niebuhr with that division. I suspect they are really channeling the Episcopal Church’s Presiding Bishop quoted in their piece. Speaking of quoting, there is no sign that Prinz and Stone discussed this matter with any Palestinians under occupation, unless you count the New York Times‘ quote from Fayez Husseini, manager of Abraaj Capital’s $50 million Pales­tine Growth Capital Fund. Filed under israel and palestine articles by Father Dave on May 14th, 2012. Comment. in recent times – public protests for their release, human rights reports documenting torture, prisoners held without due process, without charge or trial, especially the incarceration of children, and now a wave of hunger strikes that have reached mass proportions. Yet, there is barely a mention of this in the mainstream media. Unlike the lone Israeli soldier Gilad Shalit, whose capture while on duty made news headlines, almost none of the 5000 plus Palestinians imprisoned in some 30 Israeli prisons and camps, ever have their horror stories given publicity. Most of them disappear into the black hole of oblivion for years, remembered only by their families. Yet, that brings Palestinians together, since most Palestinian families have had, or have, at least one family member in jail inside Israel. More than 700,000 Palestinians (about one-fifth of the population) have been imprisoned since the beginning of Israel’s occupation in 1967, the vast majority of them political dissidents without “blood on their hands”. In fact, more than two-thirds of the Palestinian Legislative Council’s members have been kidnapped without charge, most of them serving their sentences only to be kidnapped again. Imagine any country’s legislators being rounded up like this and held without charge and ask yourself what the outcry would be. I heard those words on Palestinian Prisoners’ Day  (17 April) from a teacher, shocked at discovering how Israel abducts, abuses and imprisons Palestinian children — some as young as 12 — in the West Bank because they may or may not have thrown stones at Israel’s wall . She had tagged along with a friend to a talk given in London by [Australian lawyer] Gerard Horton of Defence for Children International–Palestine Section , and until that moment had been unaware of the brutalities of Israel’s occupation of Palestine. 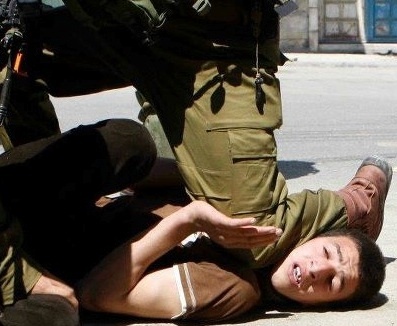 Horton’s lecture focused on a new DCI-Palestine report which documents the various traumas Palestinian children regularly face during Israeli military detention (“Bound, Blindfolded and Convicted: Children held in military detention  ,” 14 April 2012). The answer to her question is fairly simple: this woman — a member of the educated, professional middle-classes — did not know because she relies on the mainstream media, led by the BBC , for her news. And that media’s silence on the realities of Israel’s occupation is deafening. Last week, 1,200 Palestinian prisoners held in Israeli jails began an open-ended hunger strike  in protest at the illegalities and injustices of their incarceration. Another 2,300 refused food for the duration of Palestinian Prisoners’ Day. Their action came just weeks after Khader Adnan  ended his 66-day hunger strike and Hana al-Shalabi  was released (though banished to Gaza) after refusing food for 43 days, both protesting at Israel’s use of administrative detention  against them. Several other prisoners remain on long-standing hunger strikes, including 27-year-old Bilal Diab  and 34-year-old Thaer Halahleh , now into their second month without food. If this extraordinary, mass feat of unarmed resistance, where more than a thousand men and women are willing to starve themselves to death in the struggle for liberation from an oppressive regime, was taking place in China or Iran  — or any other country not behaving in the interests of the West — it would be receiving constant coverage in newspapers and on television. We would be presented with analysis, comment, talking heads, and we would know. But these brave men and women are Palestinian, and the oppressive regime is Israel, and so the media’s curtain of self-censorship has been drawn. They were eventually met by Ian Small, a senior BBC official, who told them that the BBC aimed its coverage towards a certain demographic. Occupying the main lobby of the BBC building, the protestors flew Palestinian flags and shouted: “BBC shame on you, put the prisoners on the news.” Later that day, around 300 demonstrators marched from Glasgow’s George Square to the building. And it’s not just the mass hunger strikes that are kept from us — the mainstream media’s blackout also extends to the weekly peaceful protests by unarmed Palestinians and internationals in villages across the West Bank, protests which demand Israel ends its theft of Palestinian land and which are invariably met with tear gas, skunk water  and rubber bullets by the Israeli military. Conversely, every time a rocket is fired from the besieged Gaza Strip into southern Israel, the BBC is quick to report, freely adopting Israeli-favored terminology such as “terrorists” and “militants” to describe the Palestinians. Their peaceful, unarmed resistance against their illegal occupation is not, it would seem, newsworthy. news.” We pointed out that there is plenty of violence at the weekly protests in the West Bank — it comes from the Israeli forces and results in frequent injuries and sometimes death. In fact, we said, violence by Israel’s military, navy and air force and by Israeli settlers in the West Bank is an everyday feature of life for Palestinians — if violence does, in fact, make news, there’s no shortage of it for the BBC in occupied Palestine. The BBC could fill its news bulletins every evening with stories and footage of Israel’s violence against the Palestinians — the shelling and bombing of crowded civilian districts by the military in Gaza, the burning of Palestinian olive groves and torching of mosques in the West Bank by settlers, the house demolitions , with families forced out at gunpoint, in East Jerusalem . But it chooses not to, and the rest of the mainstream media remains similarly silent. Silent, and in denying its audience knowledge of the horrors of the Israeli occupation and the Palestinians’ incredible resistance to it, shamefully complicit. Amena Saleem is active with the Palestine Solidarity Campaign in the UK and keeps a close eye on the media’s coverage of Palestine as part of her brief. She has twice driven on convoys to Gaza for PSC. More information on PSC is available at <palestinecampaign.org… . Filed under israel and palestine conflict by Father Dave on Apr 28th, 2012. Comment.